HINT: Refer to the procedures up to "REMOVE ROOF HEAD LINING ASSY". (a) Remove the antenna cord sub assy No. 3 from the roof headlining. (a) Tape the antenna cord sub-assy No. 3 at the position of the roof headlining shown in the illustration. NOTICE: The antenna cord sub assy should come to the center of the tape (100 mm x 25 mm) when taped. Try not to touch the adhesive side of the tape when taping. 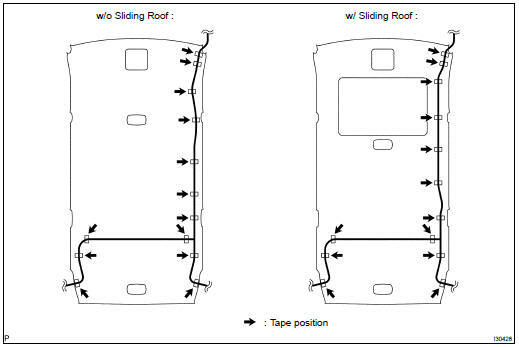 HINT: Refer to the procedures from "INSTALL ROOF HEAD LINING ASSY".